Most people consider customer experience the ultimate goal for companies and marketers, but according to Wharton marketing professor Peter Fader, customer experience isn’t for everyone. It’s no secret that modern customers are all unique. They have different preferences and also different value for brands. As Fader says, not all customers are created equal. Some will be loyal to the brand and purchase every new product, while others will only purchase items on sale and could dabble in other brands. While both types of people are customers, it’s definitely more worthwhile for the brand to invest in the loyal customer who makes bigger purchases. When it comes to customer acquisition and retention, brands should focus on quality, not quantity. Ten brand-loyal customers who recommend the product to friends and make repeat purchases are better than 20 customers who only purchase when it’s cheap and convenient. Fader talks about this idea in his new book with Sarah E. Toms, The Customer Centricity Playbook: Implement a Winning Strategy Driven by Customer Lifetime Value. Today’s customers realize they aren’t always treated the same as all other customers. Some customers get VIP treatment and special offers, while many others don’t. Customers understand the difference and realize that companies are simply rewarding customers that deserve it a little more. You can learn more about this idea in a talk at Google on customer centricity found here. ustomer experience is still crucial to brands and can have a tremendous impact in creating loyal, long-term customers. However, as companies try to connect with customers, the key is to understand their value and preferences and build relationships in the way that best works for each person. 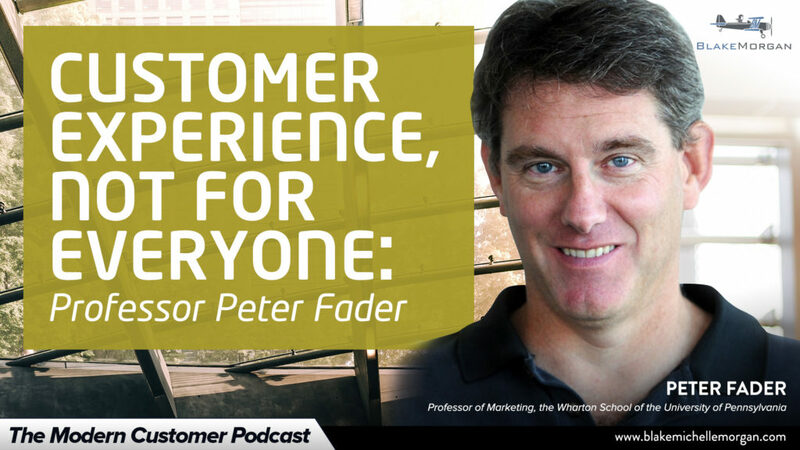 Listen to Professor of Marketing, the Wharton School of the University of Pennsylvania Peter Fader on the Modern Customer Podcast. Blake Morgan is a keynote speaker, futurist and author of “More Is More.” Sign up for her weekly customer experience newsletter here.